There was not a cloud in the sky as the sun rose on the first day of the Church of God Regional Convention in Phoenix, Arizona. April is no doubt one of the most beautiful months of the year in the Valley of the Sun. But when summer monsoon rains fall in July and August, locals know the dry desert becomes a flood plain. Hardened by weeks and often months with little to no rain, the desert floor cannot receive, but instead initially rejects, the life-giving droplets. Rainwater collects without absorbing into the ground, turning ordinarily dry washes into sometimes deadly, raging rivers. Like pastors and laypeople who minister to others but ignore their own souls, work must be done below the surface to prepare the soil for times of refreshment and revival. 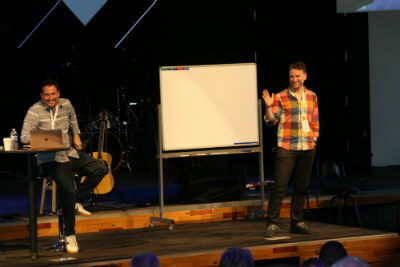 Beginning with an anointed discipleship training seminar led by Ben Hardman and Matt Tebbe, and continuing through a variety of excellent events held at Mountain Park Church on Tuesday, convention-goers were encouraged, convicted, and inspired to receive, hear, and embrace the Life. Ben Hardman and Matt Tebbe of Gravity Leadership asked questions Tuesday morning with which we must wrestle. Perhaps lulled into a sense of accomplishment following a strong sermon or a capacity crowd, pastors may not realize they’re missing the mark. Ministry becomes busyness, and relationship with Jesus is replaced with words and actions alone. But Ben and Matt insisted that Jesus wants our hearts. Their strategy for discipleship hinges on this often overlooked principle. Those who were present in Phoenix were especially moved by the interactive experience, an experience available at each of the four remaining Regional Conventions (Oklahoma City, Columbus, Fairfax, and Safety Harbor). Be sure you’re there for at least one: www.chogconvention.org. Reacquainting with friends, making new friends – a staple of Convention! 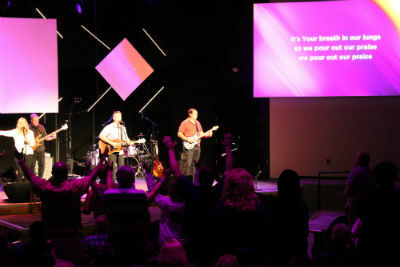 As a well-known oasis in the community, the convention host church Mountain Park is uniquely positioned to give insights and practical tools to leaders in the Church of God. That’s why they were asked to share their experience and knowledge in the form of four electives. “Cutting through the Fluff,” “Training Parents to Be Spiritual Leaders,” “Can Yoga Be Truly Christ-Centered?” and “Hiring Well” were each a resource Mountain Park Church donated to the movement. Thank you, Mountain Park Church! Worship at the first 2018 Regional Convention. For more information, including the convention schedule for Wednesday, visit www.chogconvention.org. 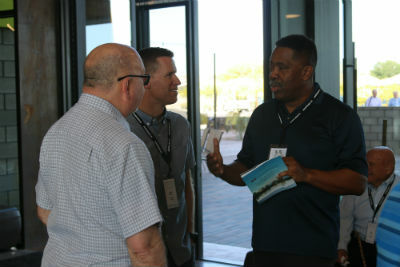 This entry was posted in All Church of God, Church of God Convention, Western and tagged Arizona, AZ, Ben Hardman, discipleship, Gravity Leadership, Jim Lyon, Life Phoenix, Mountain Park Church, Phoenix, refreshment, Regional Convention 2018, revival, training, worship. Bookmark the permalink.